St. Louis civic leaders, members of the Taylor family, which owns Enterprise Holdings, and World Wide Technology CEO Jim Kavanaugh announce plans to form a bid to attract a Major League Soccer expansion team in St. Louis on Oct. 9, 2018. The city of St. Louis will not expand its port authority — at least for now. 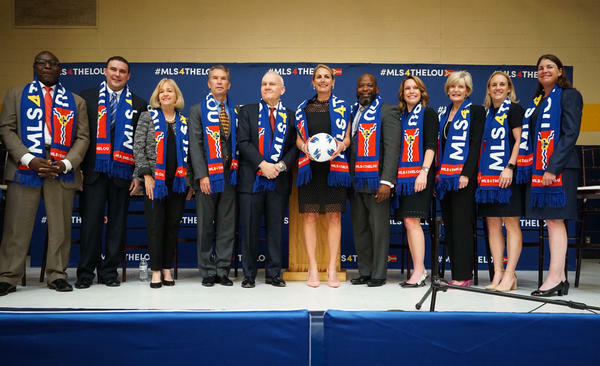 That had been the plan aimed at helping St. Louis’ bid to land a Major League Soccer franchise. But on Monday, the Board of Alderman did not consider port authority expansion during its final meeting of the session. Officials with both St. Louis Mayor Lyda Krewson’s office and the St. Louis Board of Aldermen do not believe the inaction will hurt St. Louis’ chances at joining the professional soccer league. Organizers behind St. Louis’ MLS bid had wanted to expand the St. Louis Port Authority throughout the city. That would have allowed for a 1% tax to be assessed inside a proposed soccer stadium near Union Station. But Alderwoman Marlene Davis’ legislation wasn’t considered on Monday, which is the last day of the Board of Aldermen’s session. Board of Aldermen President Lewis Reed said that some of his colleagues weren’t completely comfortable with the legislation. Some had expressed concerns about whether the legislation would make it easier to use eminent domain. Reed emphasized that he did not think St. Louis’ MLS bid was in jeopardy. Stephen Conway, who is chief of staff for Mayor Lyda Krewson, said he also didn’t think the non-passage of Davis’ bill would harm St. Louis’ MLS chances. Major League Soccer owners are slated to meet this week in Los Angeles. St. Louis and Sacramento are considered to have the strongest chances at getting an expansion franchise. The board did approve legislation that could help spruce up abandoned buildings. Alderman Jeffrey Boyd’s legislation would effectively authorize what’s known as Proposition NS. That initiative would issue $40 million in bonds to help stabilize vacant city-owned houses. Proposition NS received 60 percent of the vote in 2017, which the city counselor's office thought had missed the threshold to go into effect. But city officials successfully sued, contending that state law only required 57 percent for approval. Boyd, D-22nd Ward, said the money could help make vacant properties more attractive to potential buyers. Boyd’s legislation now goes to Krewson’s desk, who is expected to sign the measure.